Learning Resources is a popular brand in our home, we love educational toys & I love watching my children learn while playing! If your not familiar with Learning Resources, they offer educational products for toddlers all the way up to 5th grade! You will find creative play, puzzles, manipulatives & so much more at Learning Resources, all with an affordable price for parents & even teachers! 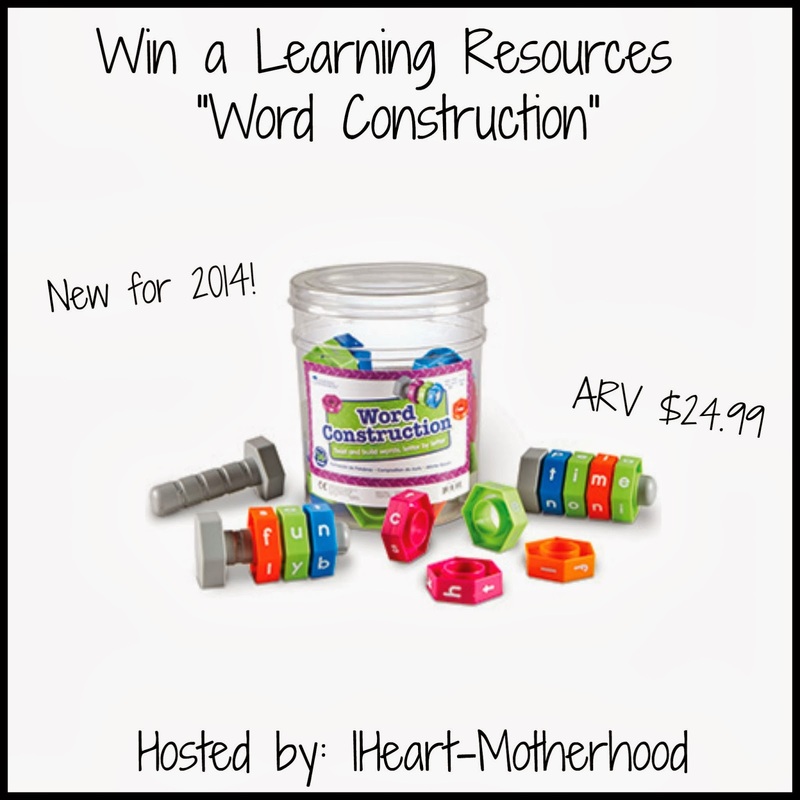 Lots of fun & great products have arrived at Learning Resources for 2014 & after browsing some of their new items, I thought the Word Construction would be a great spelling tool for my children! Word Construction is made up of 6 bolts & 30 printed nuts, your child will love building, making & spelling words with this colorful set! Start with a consonant, vowel, consonant to make a word, then turn any bolt to make a new word! The bolts hold up to 4 nuts, so your little one can create two, three & even four letter words! I sat down with Little Sister C & showed her how the Word Construction worked, she is working on her letters but recognizes a lot of them & she couldn't wait to get to work creating new words! What word(s) do you think your child will enjoy creating with the new Word Construction?! Buy it: Word Construction can be purchased online at Learning Resources for $24.99! Win it: One lucky reader will win their very own Word Construction! Use the giveaway tools form below to enter, good luck! 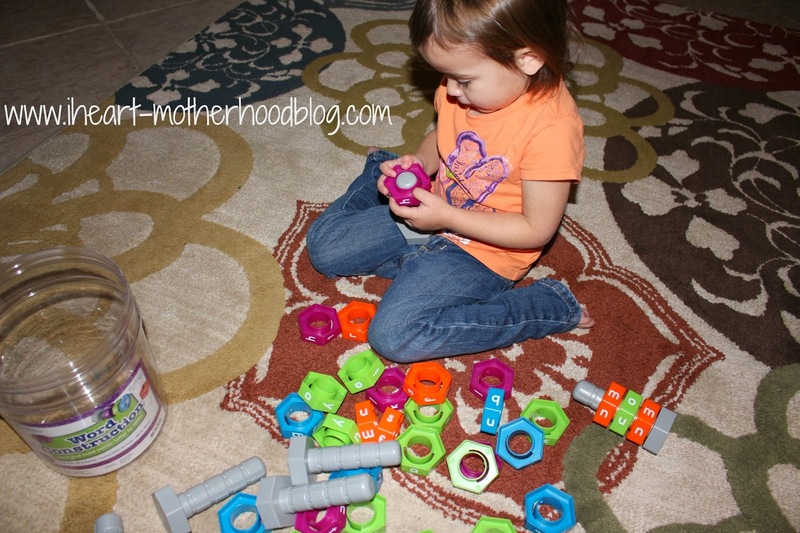 Froggy Feeding Fun looks cool! i'd like the word whiz electronic flash card for my daughter. I'd would like to get the Alpha pops too. I also would like the Word Whiz Electronic Flash Cards. I like the Word Whiz Electronic Flash Cards. I like the Giant Magnetic Pattern Blocks. I like the horoscope for my grandson. Gears! Gears! Gears! Beginner's Building Set. there was so much fun stuff! but my daughter is in love with the lacing beads in her classroom, so i'd have to say the Plastic Lacing Beads would be my pick. I'd love that huge pack of gears! Would love the Gears! Gears! Gears! Motorized Spin & Glow Building Set! Thanks for the giveaway! I would love the Take 10 Alphabet Cookies for my 3 year old son! I'd also love the Giant Foam Floor Pattern Blocks. I love so many of their items. I'm a big fan of their super sorting fruit pie. I've been wanting to get this for my daughter for a while.